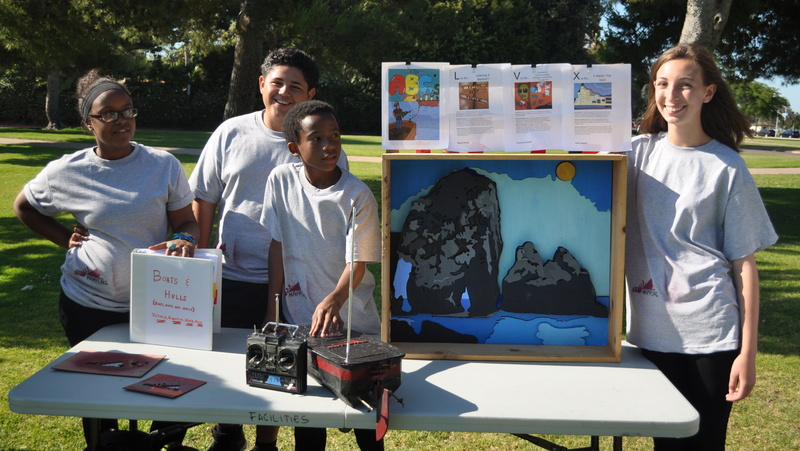 Abstract: Students studied Piracy, designed an argumentative/persuasive piece of writing, wrote children’s books about piracy, designed a radio controlled boat from scratch, and constructed a diorama to hold their finished boat. Humanities Context: Students studied land, maritime and digital piracy and what the reality of piracy reveals about ownership, advantage and exploitation. Engineering & Physics Work: Students studied buoyancy and hydrodynamics and went through multiple design spirals to geometrically design their hull. Students were either merchants (with a concentration on overall displacement and stability) or pirates (with a focus on speed and agility). After their designs were complete, students crafted a wooden skeleton for their hull and used it to shape high density foam into their final designed hull shape. Hull forms were then sealed and taken to a local thermal-forming plant to make plastic hulls for the actual boats. Students then had to select and assemble all the r/c electronics and the drive train. Students also had to design and fabricate rudders and steering mechanisms. San Diego Argonauts – A local model boat club that helped me design the project. Silent Electric Fliers of San Diego – A local model airplane club that donated many of the motors, servos, and electronics for the project. Reichel/Pugh Yacht Design – A local mega-yacht design firm that spoke to the kids about hull design and fluid dynamics. General Dynamics NASSCO – A Naval contractor that spoke to the kids about hull design and fluid dynamics, and also worked one-on-one with students on their designs. A detailed post about the conception, implementation, and student experience.